Alan Moore is best known as a comic-writing genius, the author of such classics as Watchmen, Promethea and V for Vendetta. He is also a magician – and that was what he was talking about at pagan pub meet The Moot with No Name last week. 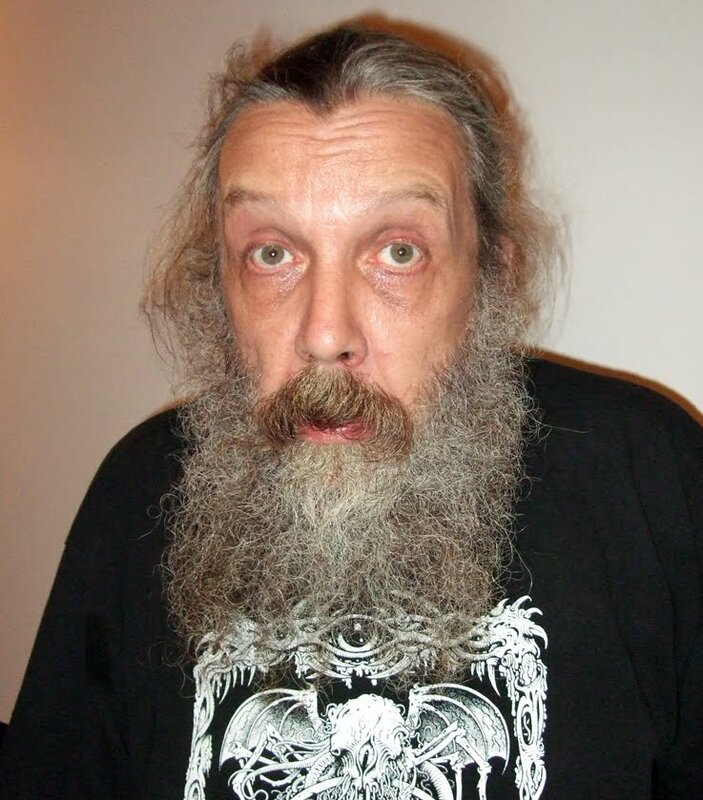 The weekly event which has lectures on occult subjects is very highly regarded and attracts some of the UK’s most experienced magicians - and the venue was packed to hear Alan Moore. It was after reading about John Dee that Alan Moore decided to take magic seriously, but his declaration that he was a magician – on his 40th birthday after a bit too much to drink – didn’t seem to surprise any of his friends. “Most people didn’t bat an eyelid,” he said. Deciding to follow through on his drunken announcement, Alan talked to his friend Steve Moore (no relation, despite the surname, but a fellow comic-writer and an occultist). Alan said that Steve, who honoured the moon goddess Selene, recommended choosing a god or goddess “because magic is an imaginary territory, so you need an imaginary friend”. In January 1994, at Steve’s house, Steve asked him if he had seen the Greek snake god Glykon and showed him a picture of a statue that had been discovered in the ruins of the ancient Greek city of Tomis, in Constanta, Romania. Alan then asked Steve how exactly one should go about worshipping a god. They took some magic mushrooms – legal back in 1994, but now an illegal Class A drug. While waiting for the psychedelic substance to start working, they chatted about what form a magical ritual involving Glykon could take. They started to formulate a ritual using cut-up techniques to combine two sets of writing; one an evocation of the God and the second a piece of purposive magic. Things started to get a bit weird. A conversation in which Alan translated “piece of purposive magic” as “evocation of the goddess” and Steve corrected him turned into a kind of Groundhog Day time-loop while the ceiling seemed to disappear and they felt the presence of entities watching from above. Alan said “it felt as though this was the body of Glykon, curving back on itself”. He said: “I was in a peculiar state for several months, because I knew magic was real in a certain sense. I am a rational person and I like to think things through. There is no proof that magic affects physical reality, but it does affect immaterial reality. Alan expressed the opinion that science cannot really explain the human mind and that “psychiatry is occultism in a lab coat”. He pointed out that psychiatrist Carl Jung was accused of occultism, while physician and occultist Paracelsus came up with the idea of the unconscious mind even before Freud and Jung wrote about it. Alan said: “We do not experience reality directly – our sensory organs send messages to our brain, which interprets them. Some scientists, such as behaviourist BF Skinner, say that there is no such thing as consciousness; it is all conditioned response. Scientists would like to be able to explain everything as biology, chemistry or physics. Thought messes up the rational universe. “But what if there are two different sorts of reality; physical existence and the idea of things? He went on: “Physical reality and immaterial reality are both real, but in a different way. We all have our own identity and our own mind space. The geography of the physical world is based on distance, but the geography of mind space is based on association. For example, Land’s End and John O’Groats might be many miles apart, but they are always close together in association. Describing magical experiments he had taken part in to share and transmit images from one person to another in mind space, Alan concluded that magic was real. Pagan forum The Moot with No Name meets at the Devereux public house, 20 Devereux Court, off Essex Street, London WC2R 3JJ on Wednesdays from 7.30pm (although the meetings on 7 December and 14 December will be at The Cartoonist in Shoe Lane in London). The picture top right is of Alan Moore. 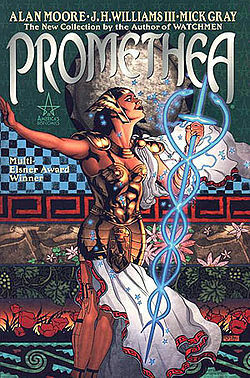 The picture bottom right is the cover of his graphic novel Promethea. Note: The Bad Witch does not recommend drug taking. Magic mushrooms are illegal in the UK.